Move this BBQ recipe to the top of your to-do list. Typical Korean BBQ is cooked like American BBQ, which is over a coal or gas burning grill, even when you order it inside a Korean restaurant. And for my latest Summer grilling recipe I marinate chicken in a sweet and salty Korean BBQ Marinade. Most Korean restaurants have a built in grill for each table, but some restaurants will bring the grill to your table. It is a unique dining experience you should try out sometime. The protein for grilling is everything from seafood to well marbled steak. Chicken, pork and beef are usually marinated in a mix of soy sauce, garlic, sugar and ginger. It's all about the marinade. The dominate sweet and salty soy flavors are a perfect combination. And garlic takes the marinade over the top. Korean-style marinade is a nice change from typical tomato-based BBQ sauces. Grocery stores are starting to carry premade Korean BBQ Sauce in the International aisle, but it's easy enough to just make it yourself. 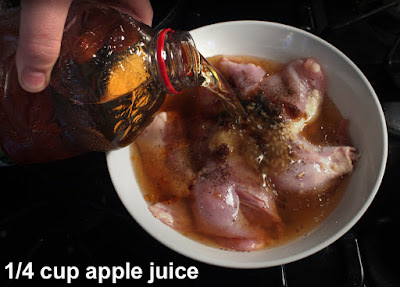 A Korean pear is another marinade addition, but I've substituted that with easy-to-get apple juice. Sesame oil is used and is more pungent that vegetable oil, but if it's too hard to find then sprinkle in dried sesame seeds - or just leave it out, the marinade will still hold up quite deliciously. 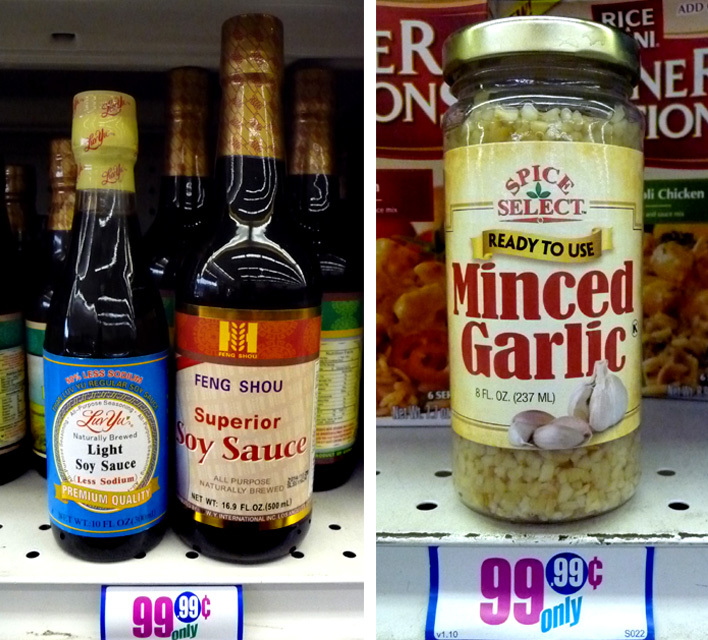 Sesame oil is great in any favorite Chinese stir fry, or an oil and vinegar salad dressing. I get most of the Korean BBQ Marinade ingredients from my local 99c only Stores. 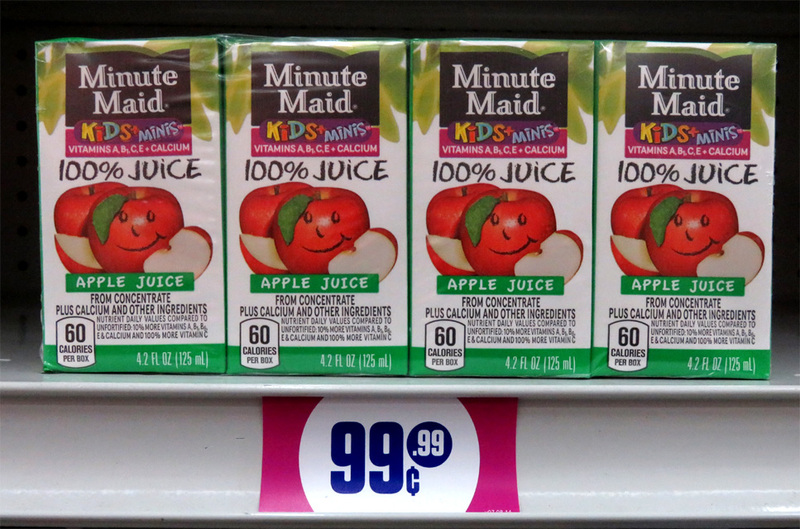 But, you can find them at regular grocery stores, too. And make sure to let the chicken marinate for at least a couple of hours. 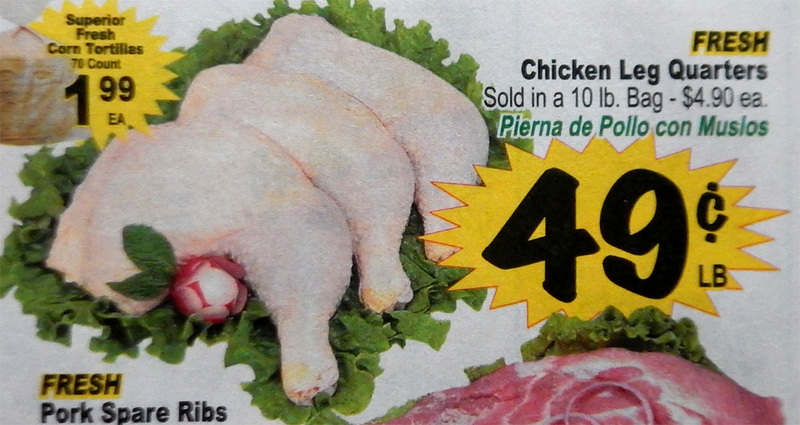 I get chicken cheaply at my local Latin grocery store. 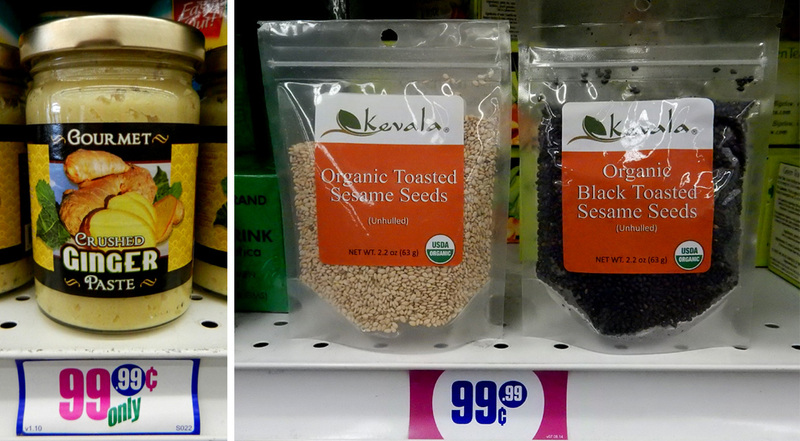 All the other ingredients are inexpensive enough. As for grilling, just do it your typical way. I have a gas grill so it's easy to barbecue chicken. I used skinless and boneless chicken, but you can grill with whole chicken pieces. My cheapie Korean BBQ Marinade goes well on beef steaks and regular hamburger, too. I'm surprised I haven't done more cooking with Korean-style marinades. Well, I've got some catching up to do, and hopefully you do too! 6 pieces of chicken - I used 3 skinless and boneless leg quarters (thigh and leg combined.) Okay to use whole chicken pieces with skin and bone. 3 tablespoon brown sugar - okay to use your favorite sweetener. 1/4 cup soy sauce - I used low sodium soy sauce and it was plenty salty. 1/4 cup. 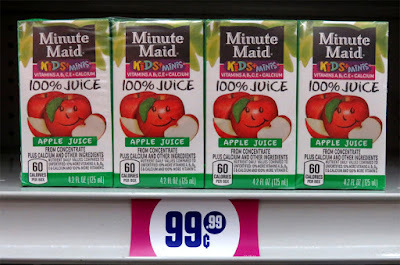 apple juice - normally grated Korean pear is used. 2 tablespoons sesame oil - optional. Okay to use sesame seeds, about 2 tablespoons. 2 tablespoons garlic - chopped, fresh or from jar. 2 tablespoons ginger - optional. Fresh or from jar. Black pepper to taste - about a teaspoon. No salt as soy sauce has plenty of salt for me. Prep garlic and ginger if necessary. I used bottled chopped garlic and ginger. In a large enough bowl to hold chicken pieces, mix all the marinade ingredients. Stir well to dissolve brown sugar or favorite sweetener. 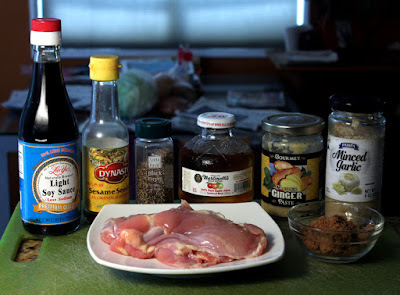 Add chicken pieces to Korean-style marinade and refrigerate at least 2 hours - okay to marinate chicken overnight. 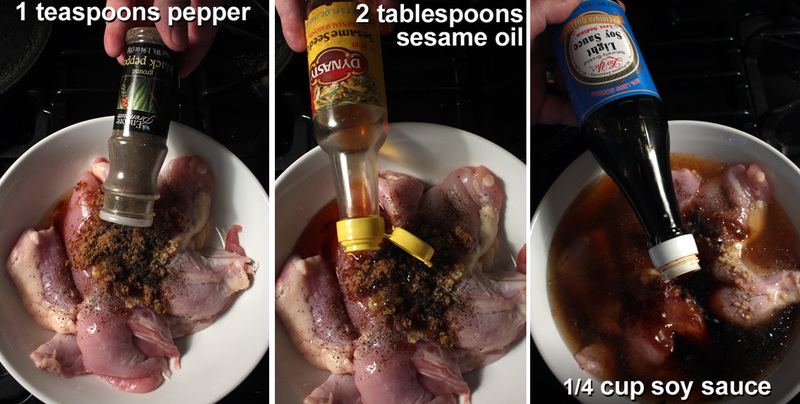 You can combine marinade and chicken in a Ziploc bag, too. You can reserve some marinade on the side to use during grilling. When chicken has soaked enough, then fire up the grill. You can use your favorite way to BBQ chicken. I have a gas grill, so it only took me about 10 minutes per side to char the chicken pieces. 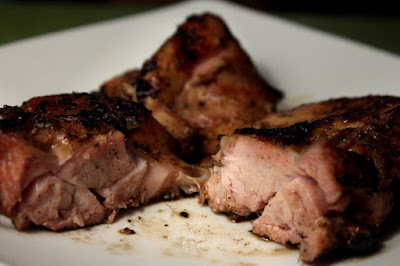 Because there is sugar in the marinade, make sure to check chicken every couple of minutes, as it can quickly blacken. Grill chicken over medium heat. Depending on the fire-heat it can be quicker or slower to cook. Chicken with skin and bone will take longer - anywhere from 20 to 30 minutes total. If you are cooking chicken skin-on, make sure to have a spray bottle with water handy for fire flareups, due to dripping grease. It's okay to brush on marinade during grilling. 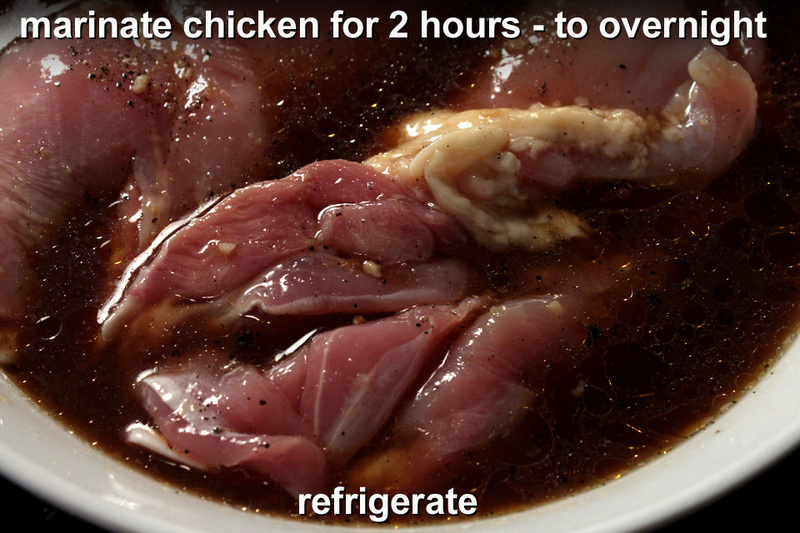 Since the marinade has raw chicken juices make sure to allow time for it to heat up enough. I stop adding marinade about half way through grilling. Of course, you can set aside some extra Korean Marinade before you add it to chicken. To check for doneness, just slice into thickest part of chicken. 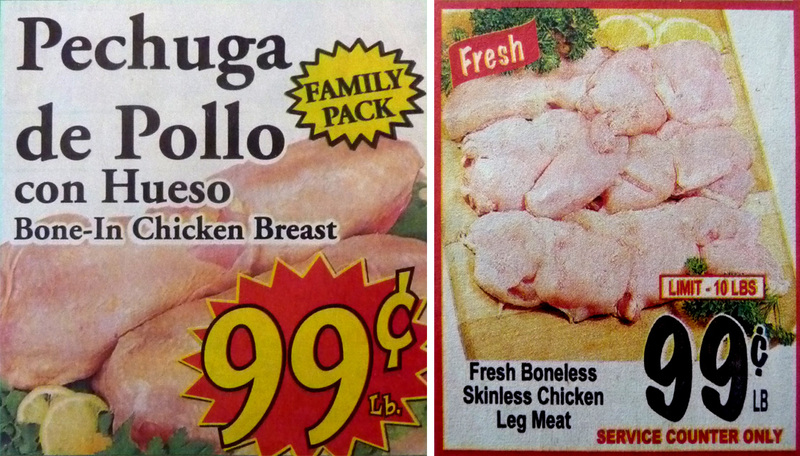 Chicken color should be white or light brown - there should be no pink juices or pink/red color. Final check is internal temperature at 165 degrees. The main flavors in a Korean BBQ Marinade are sugar, soy sauce and garlic. If you have these ingredients then you are close enough to make my recipe above. Also, you can use this marinade for any favorite protein you like to grill, including sausage, hamburger, steak, beef and pork ribs. This marinade will work well for chicken that's sauteed, baked or cooked in a crock pot. Thank you so much for the wonderful information and especially for this great recipe that for sure I will try it. It's great that you go step by step and show pictures that entice even more for it sounds really easy to cook and delicious to eat. Thank you again! !